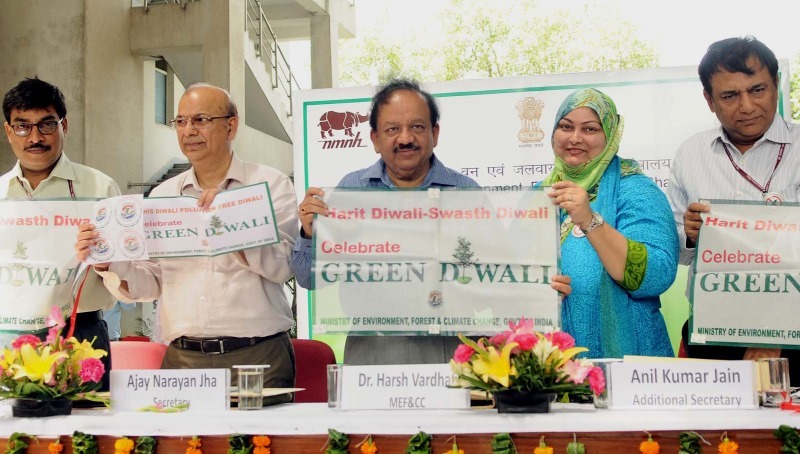 Environment Minister Dr. Harsh Vardhan launching Harit Diwali, Swasth Diwali Campaign in New Delhi. The Secretary, Ministry of Environment, Forest and Climate Change, Shri Ajay Narayan Jha and other dignitaries are also seen. The National Museum of Natural History (NMNH) of the Ministry of Environment, Forest and Climate Change (MoEFCC) invites School and College students for a Poster Making Competition on the Theme: Harit Diwali – Swasth Diwali (Green Diwali, Healthy Diwali). The participants can prepare and send their Posters on a drawing sheet of size: 22 x 15 inch along with 200 words write-up about the theme of the poster to the below mentioned address through Speed post or Courier. There is no registration fee.